We bring forward high in performance Single Die H.M. Machine. 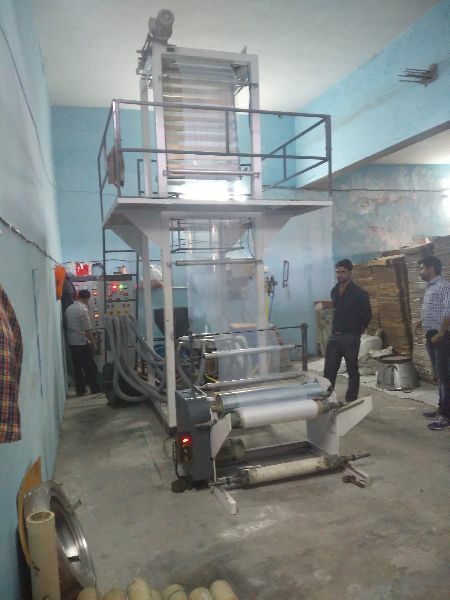 Our Single Die H.M. Machine is made with the finest components and materials as per set industrial norms. This machine is sturdily built to provide flawless performance over period of time. High Performance main motor AC inverter driver is designed for energy saving as well as minimum Maintenance. Helical Gear Box for low power consumption. Grovefeed Screw barrel for low wear, high mixing, homogeneity and high output. Candle type screen changer which minimizes material wastage. Specially designed air ring ensures uniform air supply and maximum bubble stability. Auto air refilling system for minimize material wastage. Take up roller with pnumatic system for easy operation. Winder surface type with torque motor for best winding. Special compact design for space saving. Main Motor 10 H.P. 15 H. P.
Lay Flat Tubing 3" to 24" 4" to 30"
Production 40 kg 50 kg. Blower 2 H. P. 3 H.P.